Of the many pretty towns that you will find nestled in the Tyrolian Alps, Kufstein - alongside with Schwaz and Hall - is among the prettiest. Throughout the Middle Ages, it was subject of vicious fighting between Tyrolians and Bavarians, until Emperor Maximilian I finally secured it for the Habsburg′s portfolio of properties. Ever since then, Kufstein was Austrian, however, it preserved a cultural affiliation with the nearby Bavaria that one can sense even today. Let′s go straight to the attractions of Kufstein: The most distinguished spots are concentrated in the town centre, so our sightseeing tour is best enjoyed through a general stroll around the medieval alleys. The main square is called "Unterer Stadtplatz" and nearby you will find the Dreifaltigkeitskirche or "Church of the Holy Trinity". Its base was built in Gothic style, but it was seriously extended several times since the initial construction and today, it unites various architectural styles. Nonetheless, it looks surprisingly coherent. The most important features of the Dreifaltigkeitskirche are the interiors, in particular the Rococo altar and the "Heldenorgel" or "Organ of the Heroes". No dirty thoughts here: it was built in 1931 to commemorate the dead of WWI. It is one of the biggest organs in Austria and - even though size does not matter - it is said to be one of the most difficult to play. You can witness the remarkable sound in one of the daily concerts that are performed in the church. You can continue strolling around for a bit or dive into the Bavarian heritage by enjoying one of the regional white beers. Alternatively, you can hike straight up to the main attraction: The 13th century (though it was extensively remodelled in the 16th century) fortress of Kufstein is among the most impressive military buildings of Austria. Losers get there by a mini-railway, real men walk. Either way, once you are up there you will enjoy great vistas over the Tyrolian Alps as well as the prettier part of Bavaria. Two towers of particular interests are the watchtower, the site of a Bavarian penetration in 1703. And the Bürgerturm ("burgher′s tower"), where uniforms of the legendary Kaiserschützen regiment are on display. This unit was formed by Emperor Franz I in 1804 and dissolved with the collapse of the Empire in 1918. After Andreas Hofer, the Kaiserschützen are the primary fuel for Tyrolian patriotism. For more information on the rifle regiment, you should visit the museum in Innsbruck dedicated to them. 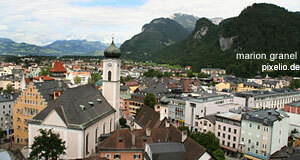 The most significant feature of the fortress if not all of Kufstein is the Kaiserturm or "Emperor′s Tower". Nearby you can also find the obligatory Heimatmuseum or regional museum dedicated to local Tyrolian stuff from all sorts of disciplines, mostly religion and warfare (matching in general with Tyrolian culture). The youngest part of the fortress was built under the reign of Emperor Joseph II in the late 18th century. It is thus called the "Josephsburg" and serves as an open-air stage these days. As you look around, you will notice a typical Tyrolian feature about towns built in a valley: Suburbs that stretch out along the river or centre of the valley in order to use every little bit of land available. Building can be very expensive in Tyrol, at least if you want to be close to big cities. All due to the mountains and the resulting narrowness. Kufstein is not only an interesting destination for sightseeing, it also offers good opportunities to go skiing in the winters or hiking in the summers (hey, it′s Tyrol after all!). The "Wilder Kaiser" mountain is particularly scenic, so is "Zahmer Kaiser". The names mean Wild and Tame Emperor, respectively. Attractive alpine lakes nearby are the Lake Thiersee and Lake Hechtsee, both easily accessible from Kufstein and interesting for hikers and bikers. Lake Achensee is not that far, either.